For the past 20 years Culturlann has been at the centre of the Irish language revival in the north. A former Presbyterian Church, its name is a tribute to the late Gaelic scholar Cardinal Tomas O Fiach and the 19th century Irish speaker and Presbyterian minister Robert McAdam, hence the double-barrelled name McAdam/O Fiach. Culturlann has come to symbolise the bi-lingual society that many of those who use its facilities are striving to achieve. President Mary McAleese has a great love for the Irish language and while in office learnt it to a high degree of fluency. Her annual visits to Gleann Colmcille in Co Donegal to brush up on her language skills are renowned and amply demonstrated in the many photographs of her and other students which adorn the walls of this cultural centre of excellence. Culturlann is a few hundred yards away from St Dominic’s grammar school, which the former president attended, and a few miles away from Queen’s University Belfast where she graduated in law and where she returned to lecture in that subject. President McAleese represented in her words and in her deeds the new and inclusive Ireland which she did so much to shape from Aras an Uachtarain. She opened the doors of the Aras to all the people of Ireland and in particular the marginalised and powerless. And nowhere was this more evident than her direct engagement with northern nationalists and unionists. 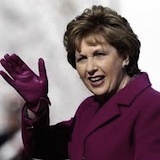 In her term in office we not only felt her genuine warmth for us, when she made her frequent visits here we felt part of the Irish nation, not spectators looking in on events taking place in the rest of this island from the north, but participants - complete Irish citizens. We felt she was our president, as if we had elected her ourselves. Her instincts derived from the nature of her upbringing and origins - she was born in Ardoyne in north Belfast and experienced at first hand the consequences of war, division and exclusion. These experiences guided her actions and scripted the many inspiring speeches she made about the legacy of conflict and division caused by British colonisation and partition. She knew, as we did, what it meant to be treated as a second-class citizen in our own country. Her inclusion of northern nationalists, as part of this nation, also extended to the loyalist people. Her husband Martin McAleese’s engagement with the loyalist leader Jackie McDonald was an inestimable contribution to peace. President McAleese leaves office secure in the knowledge that she made a distinctive and enduring contribution to the lives of all the people of this nation. She will be a very hard act to follow. However the signs are good that the president-elect Michael D Higgins will build on his predecessor’s inclusive approach to national reconciliation. His acceptance speech, as befits a poet, fluent Irish speaker and skilful orator was replete with the language of equality and respect. In sharp contrast the new leader of the SDLP Alasdair McDonnell in his acceptance speech displayed his lack of powers of oratory or the ability to see the ‘endless possibilities’ of the people of the north, who with their leaders, at all levels of society have achieved so much. The leader was not only literally ‘blinded by the lights’ while he made his speech, he was blinded by the now familiar SDLP obsession with Sinn Fein. Alasdair McDonnell’s speech reflects a party locked into defining itself as an opponent of Sinn Fein rather than what it believes in. A party which has lost its way from the high road when a new Ireland based on equality were its by-words. It remains to be seen if its new leader can rediscover his party’s old but still relevant values.